Simple, Quick & Easy Create feature-rich Live Wallpapers without writing a single line of code! Welcome to Custom Live Wallpaper Creator! Ever wanted to create your own Live Wallpapers but you don't know how? Well, Custom Live Wallpaper Creator makes it easy for you and best of all, its free! 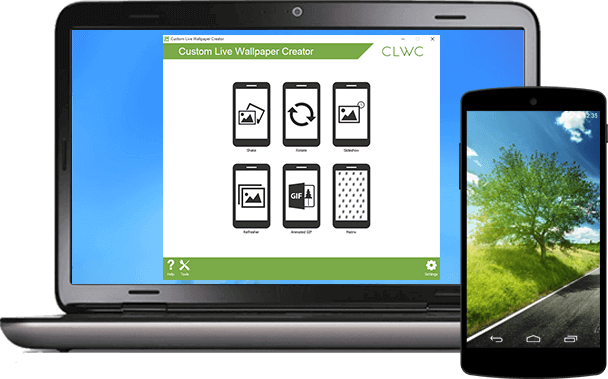 CLWC is designed to be as user friendly as possible, therefore anyone regardless of their technical ability is able to create their very own Live Wallpaper with a few simple clicks. CLWC allows you to create a variety of different Live Wallpapers such as Shake, Rotate, Animated GIF, Matrix and many, many more. CLWC displays a life-like preview of the Live Wallpaper you are currently building, so you know exactly how the Live Wallpaper may look like on your Android device. Yes, you read it correctly. CLWC is free to use and all Live Wallpapers created do not contain any visible watermark (we hate it when other applications do it, that's why we don't), so feel free to do whatever you want with them. Have you liked or plus 1'd us yet?